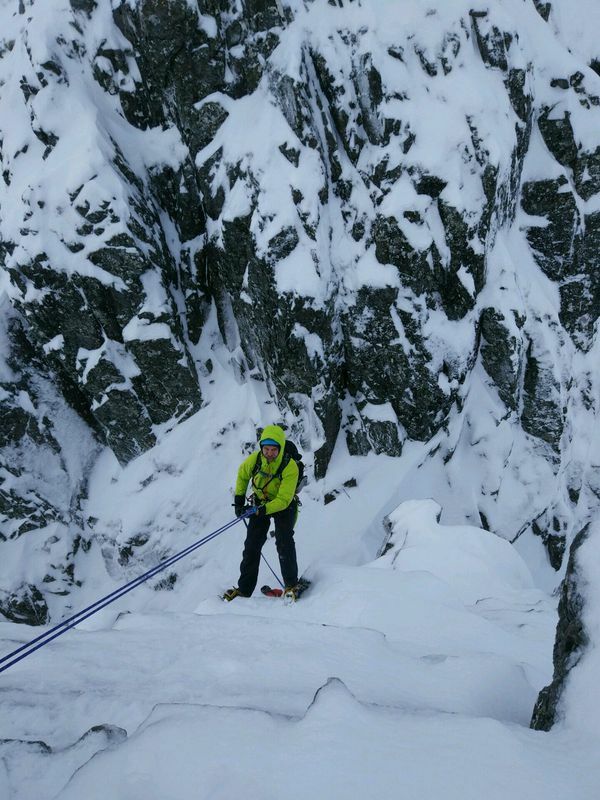 We are currently in the middle of quite a prolonged spell of cold weather, and certainly, for the time of year, winter climbing conditions are excellent. That’s not to say that the approaches are easy, as there is quite a bit of unconsolidated snow lying on top of scree and boulders. The good news is that the snow is beginning to firm up in places, and overall, it all feels very promising at the minute. We’re due a thaw on Friday evening and through the weekend, which should do the snow wonders and help bed things down a bit. Colder weather returning soon after. Both Steve and I were back out again yesterday, taking advantage of these great early season conditions. Steve teamed up with Andy, Guy and Lou, and made the long approach into the remote quartzite crags of Stob Coire an Laoigh, in the heart of the Grey Corries. Steve and Andy made an ascent of Centrepoint, which takes a line up the front face of the main buttress. Steve reported good gear, amazing hooks and a peach of a 2nd pitch! Meanwhile, Guy and Lou were getting stuck into Some Like it Hot. Slightly closer to home, I was out with good friend Harry, who was making the most of a day off from working at Needlesports in Keswick. We decided to have a look at Slab Rib Variation on Ben Nevis, which lies on the far left hand side of the Minus Face, just right of Slingsby’s Chimney. I had heard that it was a worthwhile mixed route when there was plenty of unconsolidated snow about, which it was, although don’t expect too much in the way of gear. The climb felt like a smaller version of Observatory Ridge, with similar slabby and compact rock, scope for variation and style of climbing. It’s a great route, with plenty of interesting and sustained climbing, but a bit trickier than the guidebooks suggest. We descended Slingsby’s Chimney in two abseils, but it’s worth noting that Slingsby’s Chimney is nowhere near close to being climbable at grade II at the moment! We only saw one other team, who climbed the South West Ridge of the Douglas Boulder. With the cold weather set to resume after the weekend, and the mountains being so quiet, it’s a great time to bag your first winter routes of the season. Why not treat yourself to an early Christmas present, and book some Private Guiding to kick-start your winter climbing season? After a couple of days off, I was back out on Ben Nevis today, with Ken & Glenn. Ken and I climbed the SW Ridge a number of years ago, and ever since then, we’ve tried to fit in a day on NE Buttress, but for one reason or another, the opportunity hasn’t materialised, until today. It was clear when walking in this morning that today was going to be brilliant, with cold, calm conditions, rime on the upper cliffs of the mountain, numerous dribbles of ice and consolidated snow on the approach. In fact, this must be my favourite time of the year in the Highlands, when the days are longer, the mountains quieter and options to either rock or winter climb, as well as ski and bike, oh and before the midges arrive. There was a track on the approach to NE Buttress, and although there were pillows of windslab about, much of it was avoidable. The route itself had some very useful patches of ice and plenty of consolidated snow, allowing for efficient progress, with plenty of ‘first time’ axe placements. Ken and Glen have climbed a lot over the years, and so found much of the climbing straight forward, although both paused for thought at the Mantrap (completely dry) and 40 Foot Corner (thinly iced, with some useful snow on the ledges). We descended via Coire Leis, which again, with all the snow, was very straight forward. The ice is forming higher up, but it’s still tricky to tell from a distance whether Indicator Wall and Hadrian’s Wall are climbable. Point 5 Gully was climbed, and Smith’s looked ok, if thin. Ditto for Tower Scoop. Plenty of mid-grade routes in Coire na Ciste looked fine from a distance too. The weather this weekend looks very promising, but an early start will prove worthwhile to make the most of the cooler temperatures.